The Kilkenny forward is understandably nervous about the prospect. 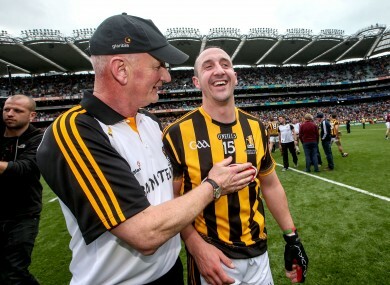 Eoin Larkin with manager Brian Cody after yesterday's game. KILKENNY’S HURLERS WOKE up All-Ireland champions this morning and can look forward to a winter of Noreside celebrations mixed with club activities. For Eoin Larkin the future is slightly different to his teammates. The 31 year-old’s day job is with the Irish Defence Forces and he is now getting set to head to Syria on a peacekeeping mission. Given the currently volatile situation in the country, Larkin is understandably nervous about the prospect. “I’m going out peacekeeping there in Syria with the Army. It certainly will be different to most years,” he told Marty Morrissey on RTE Radio One’s Morning Ireland earlier today. “It’s something I have to do and is part of my job. We will go out and do it this year and see how it goes. The James Stephens club man claimed his 9th All-Ireland senior hurling medal yesterday. He apportioned credit for his extraordinary achievement to teammate Jackie Tyrrell whose rousing half-time speech helped ignite the second-half display that propelled Kilkenny to victory. “He gave a great inspirational speech at half-time. I think Brian summed it up last night, that’s what the whole Kilkenny panel is about. “Jackie got injured and Shane Prendergast came in but he never lost focus what we were about and that was to win the All-Ireland. Email “Syria peacekeeping ahead for Kilkenny's Larkin - 'I'm very apprehensive and nervous'”. Feedback on “Syria peacekeeping ahead for Kilkenny's Larkin - 'I'm very apprehensive and nervous'”.